With all the jewelers releasing fragrances these days — is there a jeweler left in Paris without a signature fragrance or two? — a bit of conceptual overlap is not surprising. Olivier Durbano, a young architect-turned-jeweler, has launched a line of scents inspired, like the Bvlgari Omnia flankers under consideration yesterday (Omnia Amethyste) and the day before (Omnia Crystalline), by precious jewels, and his first two releases, Rock Crystal (2005) and Amethyst (2006) mirror the Omnia flankers perfectly. Five more fragrances are said to be in the works (and I rather doubt we've heard the last from Bvlgari on the subject of Omnia, for that matter). The notes for Amethyst include bergamot, pepper, grape, raspberry, incense, palisander wood, jasmine, orris, vegetable amber, sandalwood, musk and vanilla, and I have to say that the list did not warm my heart. Green apple still tops the list of notes I'd like to see banished from perfumery, but grape is surely not far behind. Grape blended with raspberry: no thanks. In the event, I needn't have worried: Amethyst is very much in the niche fragrance tradition, and the grape is neither candied nor strong, and what there is of it is layered over heavy incense almost from the start. A fruity floral, this is not. As the fruity opening fades, there is a smidge of something vaguely sweaty and cuminish, but it is slight and doesn't last. After that, Amethyst is mostly woods and peppery incense, a bit fruity but more dry than not (although not so dry as the sauna-like Rock Crystal, which is also based on incense). It is not nearly as warm, ambery or vanillic as Juozas Statkevicius — this is an almost summery incense, rather quiet and soft, and its muted, relaxing presence reminds me of Comme des Garçons' Ouarzazate, although they don't smell much alike. Nothing about it reminds me of amethysts, or even of the color purple, but then, Omnia Amethyste didn't call up any such association either. Still, Amethyst is a worthy rendition of incense, and if, like me, you can't have too many variations on the theme, do try it. I don't know a thing about the five projected fragrances to come, but I'll be thrilled if they're all based on incense. A deep-green incense for emerald, maybe? Count me in. Olivier Durbano Amethyst is available in 100 ml Eau de Parfum ($105). 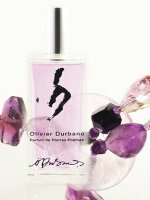 For buying information, see the listing for Olivier Durbano under Perfume Houses. Rock Crystal is nicely done, but doesn't appeal to me nearly as much as this one. Not sure why — on paper, it sounds better. The world needs a really green incense! I also was surprised at liking this better than Rock Crystal (which seems awfully generic to me). And since emeralds are my favorite gems. . . . I have a hard time thinking of any incense scent as generic, but I do know what you mean. I didn't find it nearly as interesting as Amethyst. I wasn't particularly impressed with Amethyst at first sniff on a paper card at the Spring Sniffa, but when I got a liquid sample, I loved it. The combination of light fruit and peppery incense/woods is quite refreshing, and I find myself reaching for it often. No lurve for grapes; no lurv for Princess Muscat in the house? In defense of the fruity … I just read an article about wine that said, “Drink what you like!” The market is now full of full-bodied, jammy, big, overripe California reds, so much that wine lovers bemoan the undiscovered country of the woodsy, tannic, dryer reds in the European style. Wine producers make a lot of the big fruity reds because people find them easier to drink and therefore buy a lot of them. Similarly, fragrance houses release a lot of fruity florals because they are innocuous and easy to like, so people buy a lot of them, too. So … as a devil's advocate might say, more power to the fruity florals, wear what you like! Also, I find that some of the niche fragrances are absolutely unwearable, those prestigious Ormond, Serge, L'Artisan. I don't think any of the fruity florals (due to their lack of a strong personality) are unwearable. If there's incense, count me in too. I haven't smelled Amethyst yet, but after reading this i'll sure give it a try. I hate paper cards — I'm no good at them, and they always mislead me one way or the other! The big overripe CA reds are such a step up from what used to pass for sophisticated in the US — blush wines & the like. I can't say the same for most of the fruity florals on the market today. So, totally agree with wear what you like, but also would suggest that it doesn't hurt to broaden your horizons — and if I was blogging about wine, I'm sure I'd feel the same. And PROMISE that I could send you a few fruity florals you'd find unwearable! Try them both, if you can! Rock Crystal has some fans too although it didn't suit me. Yeah, I meant generic incense:) It smelled like about 4 other scents I have (Armani BdE, Cdg, etc. ), but not as interesting. Perfectly nice, but. . . .